If I actually lived by the advice "dress for the job you want, not the job you have," I would probably end up in my boss's office explaining why I thought it was okay to wear an Iron Man suit to work (or maybe this). Point being, as much as we want to show our fandom, there is a time and place and your 9-5 desk job isn't always that place. But never fear, it's not all business casual or Ann Taylor Loft from here on out. There are ways to push the boundaries (especially on casual Friday) to let your geek flag fly even without wearing that super cool Captain America hoodie you got at Target. 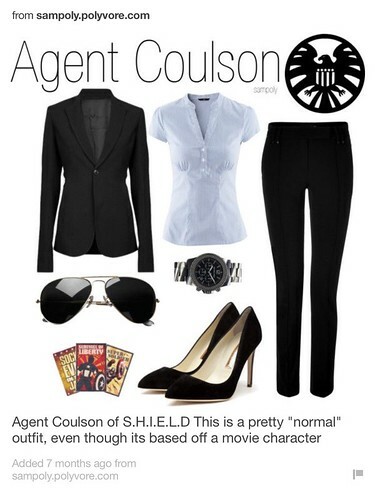 Agents Carter and Coulson are quite work friendly, while the Star Lord-inspired outfit is a bit more weekend wear, but you get the idea here. You can very easily get sucked into a fashion hole looking at all these options. So, take to your closet and see what you can put together. 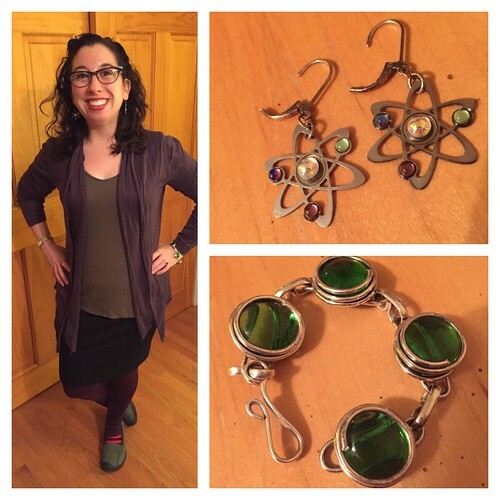 Here is my Hulk/She-Hulk inspired outfit featuring purple fleece-lined leggings (a must for New England winters), a pencil skirt, a green and purple top and some accessories to represent science and gamma green. I don't really think anyone would look at this outfit and think "she looks like the Hulk", but I know what I'm doing and that's what's important. Do you have any personal space at your job? Are you allowed to decorate it? In that case, art prints, vintage posters, and desk trinkets are your friends. There are so many amazing artists doing comic related art and lots of crafts ideas to make your space feel a little more you. 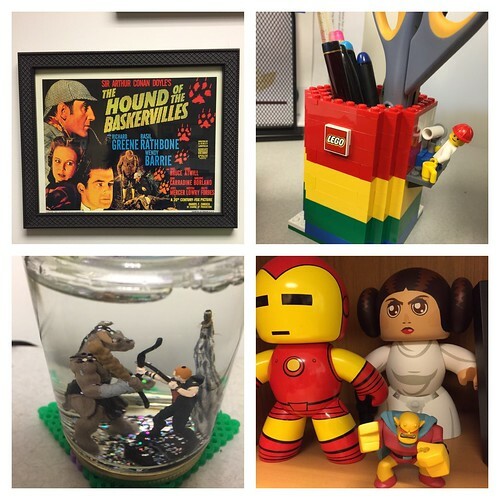 Here's a look at what's in my...well I hesitate to call my office my sanctum sanctorum, but I do spend a lot of time there and hence like to fill it with things I enjoy. Your lesson here, my fashion mavens, is to keep it clean and work appropriate. Some of these things have been great conversation starters and have helped me identify some like-minded souls. 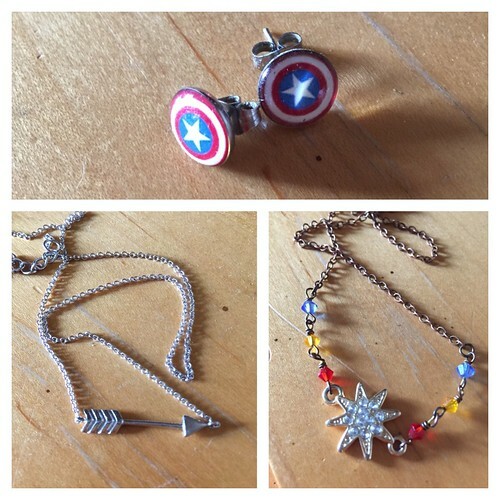 Someone notices your Sherlock Holmes poster or Captain America earrings and all of a sudden you are networking about stuff you like talking about (Note: I am a lousy networker about other stuff). I would love to see what others do with space or clothes to share your fandom, share some pics if you have them. Besides, I'm always looking for new ideas.